Three days ago, I switched on my main work PC and heard one long beep followed by three shorter ones. The machine booted but the display was blank. Checking a list of BIOS error codes on the global internets, I confirmed my first diagnosis: the video card was fried. Curiously, I remembered the point it happened. I woke in the night hearing a “phhhzzzt” noise, followed by silence. Utter, complete silence. At first I thought the extreme weather in the frozen North had finally brought the proto-apocalypse. The power lines were iced up, the generators were down, the roads were impassible. I would get up in the morning to see an old lady greedily chewing the hind leg of a stray dog in the car park. But, no, it was just a power surge and the sound of silence was the absence of cooling fans. The temporary death of my PC. Which got me thinking about the nature of gadgets – and what actually constitutes one. With my three year old PC, I was able to order a new video card on t’internet. It arrived in two days despite the winter climes and was installed in two shakes of a lap dancer’s tassles. It’s back to being the centre of my office network, despite its age and relative decreptitude. But, here’s the rub, if I had woken to find my iPod’s display fried or my HTC Diamond’s sound system silent – there would have been nothing I could do. Out of warranty, uninsured, they would be nothing be rather expensive paperweights. So – one of the key signifiers of gadget-hood is disposability. Built in obsolescence. This observation isn’t new. Like many proper geeks I took things apart as a lad: toasters, tape recorders, old televisions…And like most proper geeks I soon learned how to put them back together. 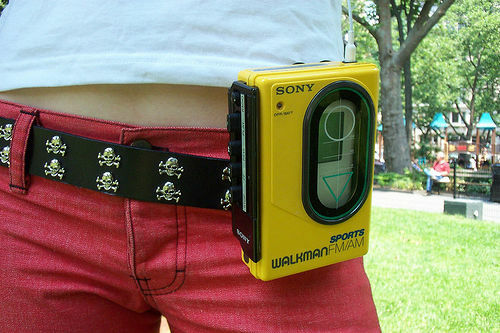 That is, until I opened up my first Sony Walkman. I gained access to the inner workings easily enough – four screws and a few plastic tabs to unlock – and then it exploded. The components were spring-loaded; designed to self destruct. My brother, whose player it was, was so unhappy he gave me a Chinese burn and put HP sauce in my tea. At least, that’s what he said it was. Is disposability all that desirable? What waste this tendency generates, as we cast one example of old technology after the other into the landfill, 18 months after it was first loved, then liked, then loathed, then lost. I don’t think it is. But I’m just as complicit in the perpetuation of this cycle as the next tech blogger, the next gadget journalist, pointing the spotlight at the next shiny new thing before the old one in your pocket has even lost its polish.